China is an amazing land of opportunity, and if you want to build anything, you can build it in Shenzhen. This city that was just a small fishing village a few decades ago has grown into a cyberpunk metropolis of eleven million and has become the manufacturing capital of the world. You’re probably reading this on a device made somewhere around Shenzhen. 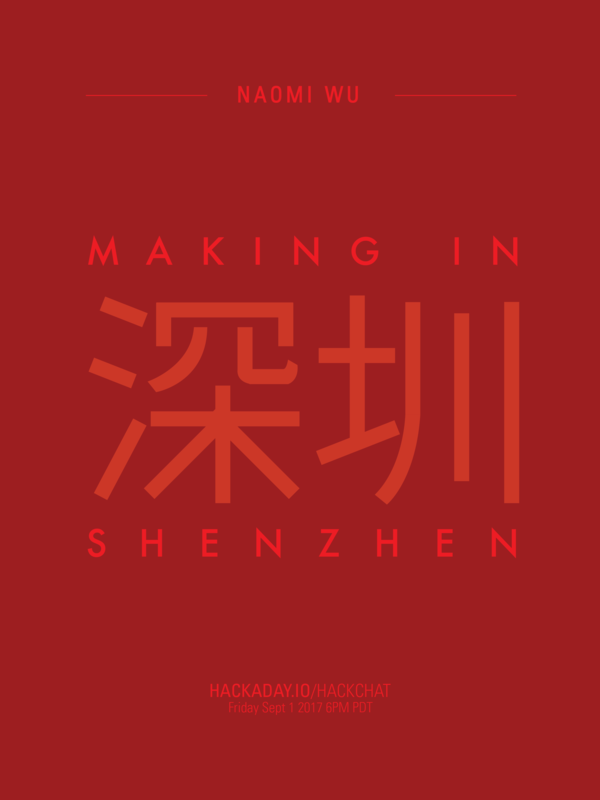 For this week’s Hack Chat, we’re going to be talking about manufacturing in Shenzhen. We’re bringing in a very special guest for this one: [Naomi Wu] is a Cantonese DIY maker, professional web dev, transhumanist, electronics reviewer, occasional Hackaday contributor, vlogger, 3D printerer, advocate of women in STEM, SexyCyborg, and a riot on Twitter. [Naomi] also lives and works in Shenzhen, and is tapped into the DIY and maker culture there. She’s created 3D printed pen testing shoes, a Raspberry Pi cosmetics case, and infinity skirts. This Friday (or Saturday, depending on which side of the date line you’re on), [Naomi] is going to be talking about manufacturing, making, DIY, and Shenzhen culture. Of particular interest will be electronics purchasing and manufacturing in Shenzhen, designing wearable projects with an emphasis on power and thermal design, documenting projects, and Shenzhen culture. This is basically an AMA, so if you have any questions you’d like to ask, throw them up in this spreadsheet. Our Hack Chats are live community events on the Hackaday.io Hack Chat group messaging. Hack Chats are usually at noon, Pacific time on Friday. This week we’re doing the Hack Chat a little later, because timezones. This week’s Hack Chat will be at 6 pm PDT Friday / 9 am CST Saturday. Confused? Here’s a time and date converter!